Dinner Digs takes on University as it scours the best, cheapest foods on-campus that will see you through the 9am starts. If you’re like me and can rarely be bothered to pack a lunch for uni/forget it at home/eat it before you even get there, here are some recommendations of where to find the best vegan options on campus. Wave goodbye to soggy sandwiches and dry, bland couscous (misery grains), and say hello to a whole world of great lunch and snacking opportunities. The Dhaba Café is renowned as the best veggie spot on campus. Their ‘on the pulse’ vegan options are great, with hearty dishes such as stews, curries, salads and soups. All for a reasonable price of around £4. However, I recently discovered The Bridge Café which is above North South Road, linking Pevensey 1 and 2. They offer similar food to the Dhaba, with meat options. The café is bright and has a lovely buzzy vibe of mostly post-graduates and staff members which creates a more chilled atmosphere. The day I discovered this place back in first year I realised my life, and bank balance, would never be the same again. The student union website describes the line as resembling a “Soviet-era bread queue”. Whilst I find this slightly distasteful, I can’t help but argue that their food is worth the wait. Although I have to say, a buzzer system like Falmer Bar wouldn’t go amiss. Awkwardly waiting around within earshot for your number to be yelled grows tedious. I’m going to be honest and say I don’t like the food from Falmer Bar. I didn’t like it from East Slope and now I live off campus I can’t see myself making the treacherous journey to Northfield. I find Falmer’s food boring, bland and just a bit lazy… however it’s cheap-ish, quick and easy so if it works for you, go for it – I can see it hitting the spot as a hangover cure if you’re desperate! Room 76 has been getting inventive with their cakes recently. Whilst I don’t have a sweet tooth, I’ve heard great things about their vegan chocolate and banana cake, which is apparently a real wedge of a portion. It’s the place to go for a soy coffee-and-cake pick me up when the study induced fatigue sets in mid-afternoon. Some days there’s just not time for a hot meal on campus. That’s where the student union shop comes in. Bagelman bagels are an absolute dream, especially the seitan BLT which always hits the spot with intense garlic mayo that forces you to buy a pack of Extra with it every time. Sadly, spending around £4 on a bagel isn’t exactly student friendly, so I often opt for their veggie samosas/Indian snack box. Whack them in the microwave in the shop for a minute and bosh, jobs a good un for just a couple quid. So rather than carting around a packed lunch all day, full of those cheap stundent ‘delicacies,’ why not have a hearty meal at a low cost to keep you going througout the day. There are plenty to choose from, and they are right on your door-step too! 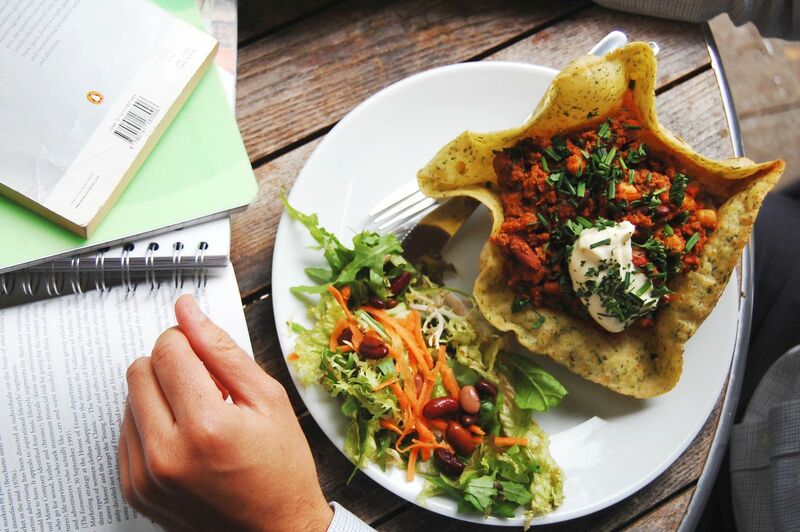 Find out more information on where to eat directly on the University of Sussex website. But, always be in-the-know on all of the latest dinner digs both in the Badger, and through Rosie’s @porkbellyandtofu on Instagram.